I have put down a deposit for a baby ruppell's parrot. Will be recieving him/her in about 8 weeks. Does anybody have any info on ruppell's? I've done as much research as I can on them but hard to find much on them since they are rarely owned. Anybody with first hand experience of their behavior and attitude? Are they similar to other pois? I don't have any experience with a ruppels but hopefully RavensGryf will stop by as she has a wealth of knowledge on ruppells. Look forward to hearing more from you and your future baby bird. Cheers. I have a crazy Ruppell’s Parrot. He’s hanging upside down photobombing my Pionus in my avatar . 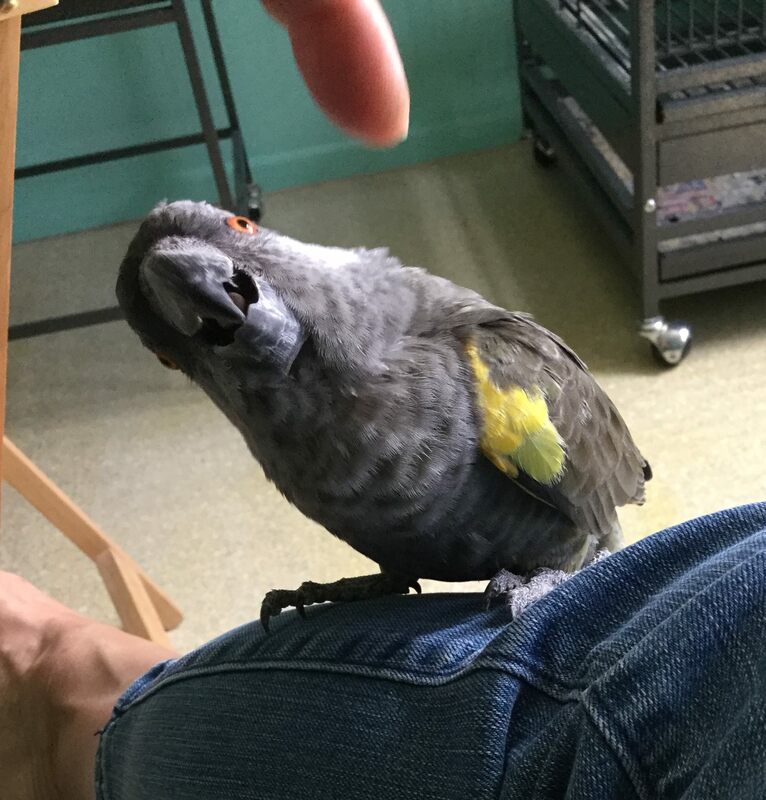 Griffin does have a hair-trigger bite reflex with an oversized beak typical of a poi, but he is just a character, and I have to say he is unlike ANY other parrot I’ve ever owned or seen lol. It’s hard to describe his unique personality, but he is just so funny and adorable. He keeps me laughing. He also thinks he’s big and bad but he’s just soft and cute lol. Though Griffin was a hand raised baby and completely tame, he doesn’t like to be touched. He also seems to have stronger more in tact wild instincts than some other hand raised parrots if that makes sense. I think his personality is more individual, and not his species. He is a very different guy from his “cousin” my Red Bellied Parrot. Naaaawww. He looks really well! Thank you for your insight. I can't believe how uncommon these guys are. There is almost no information on them online and if there was they all say the same thing. They were never exported in large numbers like some of the other Poicephalus. Perhaps because they’re more “plain” colored? Line up a row of all parrots and you'll notice one of those guys against the sea of green! Yea personally I like the colors of the ruppell's over the other poicephalus. Blue is such a rare color in nature plus I get tired of looking at green all the time. Although a green parrot in good plumage is beautiful, none of my parrots happen to be green. Out of the 7 birds, some have green on them, but not what you’d typically think of as a “green parrot”. I love Griffin’s bi-color. The yellow really pops against the gray. His ankles (thighs?) are actually orangeish-yellow, so he’s actually tri colored. He’s being a little too helpful with my iPad keyboard right now . I’d better keep my fingers out of the way! You do know the males loose the blue after the first molt? So if you get a male he’ll look like Griffin . The mature females look like the babies with the blue. They’re both pretty I think. Last edited by RavensGryf; 04-13-2018 at 09:21 PM.